Make an entire week's worth of food of healthy, all-natural baby food in less than 5 minutes and for less than $3! 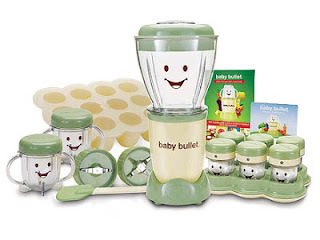 The Baby Bullet Baby Food Maker has all the power and convenience of the Original Magic Bullet Food Maker. You'll enjoy the ability to make fresh, organic, nutrient-rich baby food in an instant. With an all-new blending blade, you can perfectly puree healthy baby foods for every stage of your baby's development. Pour your puree into one of the six included BPA-free storage cups, which conveniently features a date dial to note when the baby food was made. A month's worth of baby food typically costs up to $70, but with this versatile baby food maker, you'll be able to stretch your savings even further. The unit is fun, easy to use, and very easy to clean since all the pieces come apart. The instructions are easy to follow. The freezer tray makes it easy to store large amounts of food allowing you to make and store enough baby food for at-least 2 weeks. The storage jars are are a nice size and are perfect for on the go feedings. Because of this unit I look forward to making my daughters food and knowing exactly what is in her food gives me a peace of mind. I even make food for my nieces and nephews. They all love the food I make with this unit. All in all, I love the Baby Bullet and am so happy there is an affordable system out therefor parents to easily and quickly give their children the freshest food possible. A must buy. Highly recommended for anybody with children. This would also make the perfect baby shower gift! Baby Bullet is giving away a Baby Bullet to one of my lucky followers! One (1) winner will receive: The Baby Bullet. Ends 7.8.13. 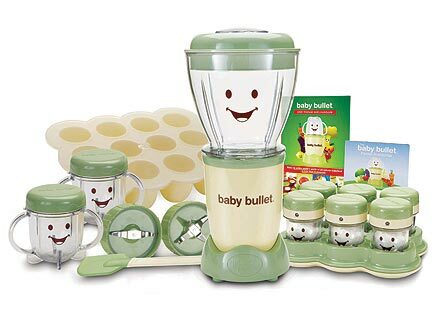 DISCLAIMER: All products received are complimentary for testing purposes from Baby Bullet. All opinions stated are my own and are not influenced by any affiliates. It seems like a simple and quick way to make baby food! This thing is SO easy to use and amazing for making baby food and more! Love it! I have heard some great things about this product. Thanks for the great review. I love that it is made just for making natural baby food! I plan to use one of these for my baby on the way! I had a baby bullet and loved it-saved me a ton of money! I think the thing I like most is the fact you're using fresh fruits and veggies. My favorite thing is I can use organic fruits and veggies! After reading how artificial sweetners are now hidden ingredients by some baby food companies, I am all about making baby food for our next on, due this fall. I love the simple fact that with the baby bullet your making your own baby food, so you know EXACTLY what is being put into your baby's food with no hidden ingredients! I like I that I know what my child is eating. That I know what is in my babys food!!! I love it comes with everything except the food and water. The convenience factor has me sold! I only feed my baby homemade baby food, and I think this lays down a good foundation for the entire family to eat healthy! My son's just about ready for food - we're trying rice cereal this week! I know I am going to make our own food and this would be awesome. I think this would be much easier to use than a plain old blender. Small, portable, know what's going into my babies food! When you have twins, everything is double the cost so eating healthy and eating what we normally have in the house makes things so much more cost friendly. It helps when you can also make a few weeks worth and freeze half of it. 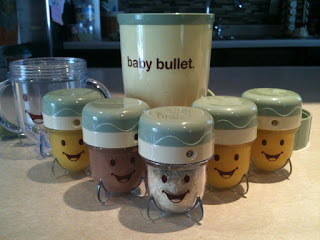 Using the Baby Bullet is a snap to make my grandson healthy food fast! I would love to have a baby bullet!!!!! My parents made my own food and I am a great eater... I really want my daughter to experience the same thing! I love that it is easy to use and I can make my own food for my baby so I will know exactly where it is coming from!! Thanks!! I don't have a baby bullet yet but plan on getting one with next baby due late Oct! I love that I can make food for my baby easily at home! I don't have one yet but would love to have one it looks like everything is there and would be so convient for making healthy baby food! I like the fact that I can use fresh organic fruits and veggies to make my babies food. I would love this! It would give such peace of mind knowing that my baby's food doesn't have any harmful stuff in it. I love that I can feed my baby fresh, local, homegrown food with no preservatives or added chemicals! Healthy baby! i have a magic bullet and love it. i would love to have the baby bullet to make homemade baby food that doesn't have preservatives. I can make my own baby food with fresh, organic ingredients! I would love that baby bullet! I love how i am able to make baby food for my LO without any preservatives. I can make baby food with the ingredients I know are good for my little sweetheart and by the way, I love the cute lovely design. I enjoy the ability to be creative with food for the little ones. My daughter was such a picky eater and I was worried that she was not getting enough nutrients, but with the Baby bullet I can make fun meals she will actually want to eat. I love knowing that I am in control of the quality of the food my baby eats, and its fresh. Having my little one to be able to eat what the rest of the family is eating. Oh wow where do I begin?! My little one is 11 weeks old, and quickly inching up on that 4 month mark where we can start introducing a few solids! Though I'm excited, I only want the best nutrition for my baby girl. Ever since I saw the Baby Bullet I have been obsessing about everything we will be able to do with it! Now it's just a matter of getting a hold of one and being able to try it out! I think I will be the perfect canadate for this giveaway because I will literally be using it from the grinding of oats to the chopping up of spaghetti and meatballs. I would love a baby bullet. I don't own one yet. I imagine that it will make my life a lot easier with making baby food in less than 5 minutes.